While Colorado is my home, I remain a Montana girl at heart. Every year I make it a priority to visit my family in Montana, where I spent most of my adolescence. 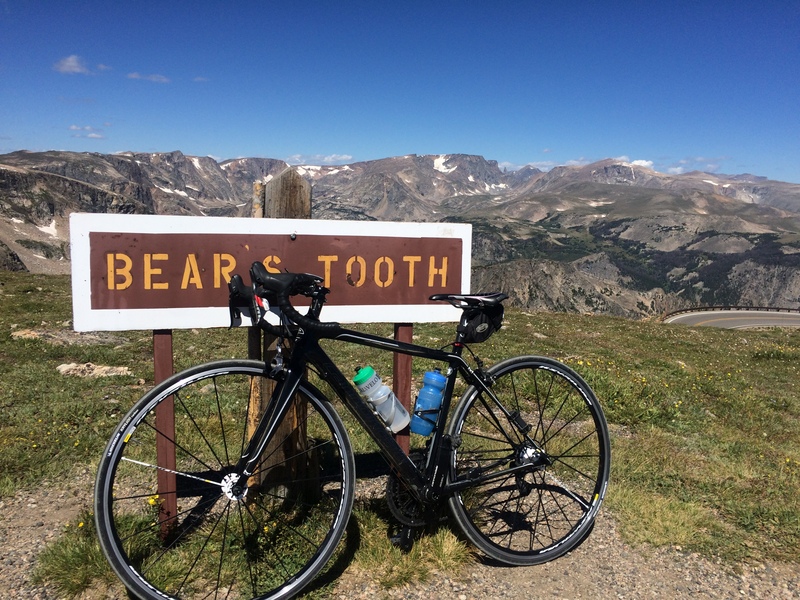 This year I brought my Cannondale Evo along to ride during my visit. Billings is just large enough that there are parts of the town that I’m not familiar with. I grew up on the west side and rarely ventured to the other parts of town. Therefore, I wasn’t exactly sure where each of my rides would take me. This “from the saddle” discovery is one of the funnest parts of riding and has the potential to turn each ride into a fun adventure ~ or not. The view from Molt Road. The wild turkeys didn’t make it into this pic. 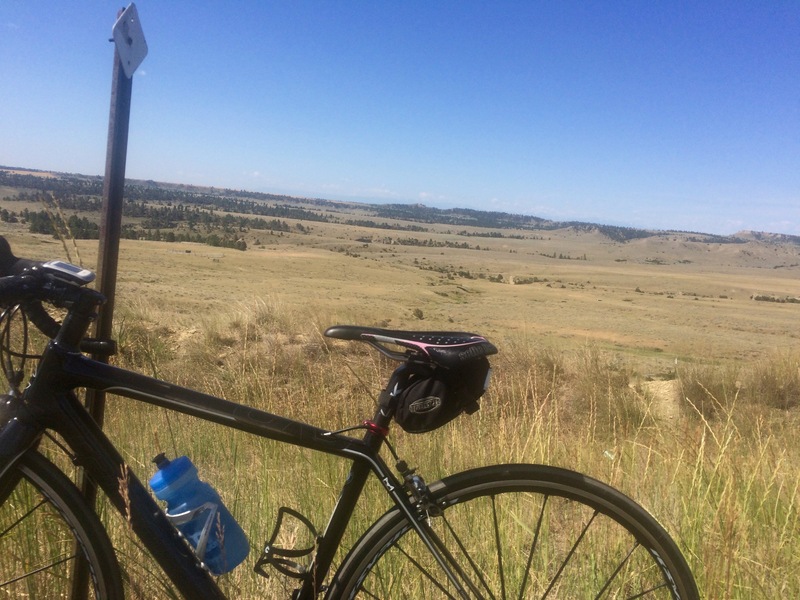 On my first ride, I decided to take the Molt Road out of Billings. I was planning to ride out and back and expected at some point I would see a sign indicating how many miles it was to Molt. 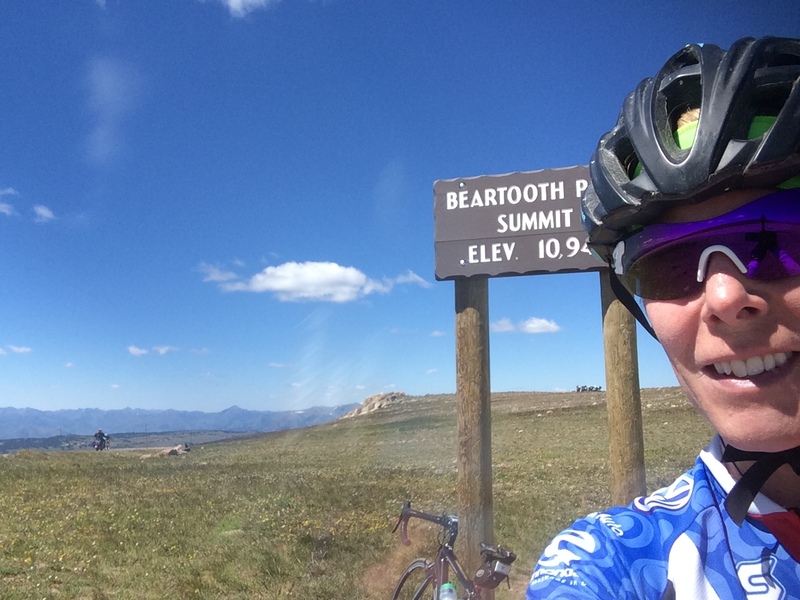 Since there was no sign- or because I missed it – I just rode until it was time to head back to Billings for other commitments. I could see Molt in the distance, but would have to save the complete ride for another day. 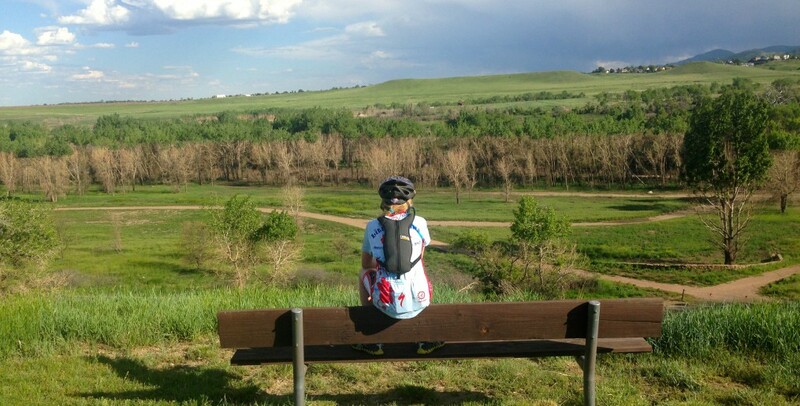 On the next ride, I went to the Billings Heights part of town. I happened upon a bike lane and followed it until it ended. I ended up riding in a big loop. I then came upon a pretty nice bike path along Alkali Creek Road and decided to see where it went. After a few miles, I caught up to three women out for their morning training ride. I rode with them for a few miles and it turns out one of the gals was on the committee that plans the Billings bike path. She was a wealth of information on the bike path system and gave me some helpful directions and ideas about where to ride in Billings. 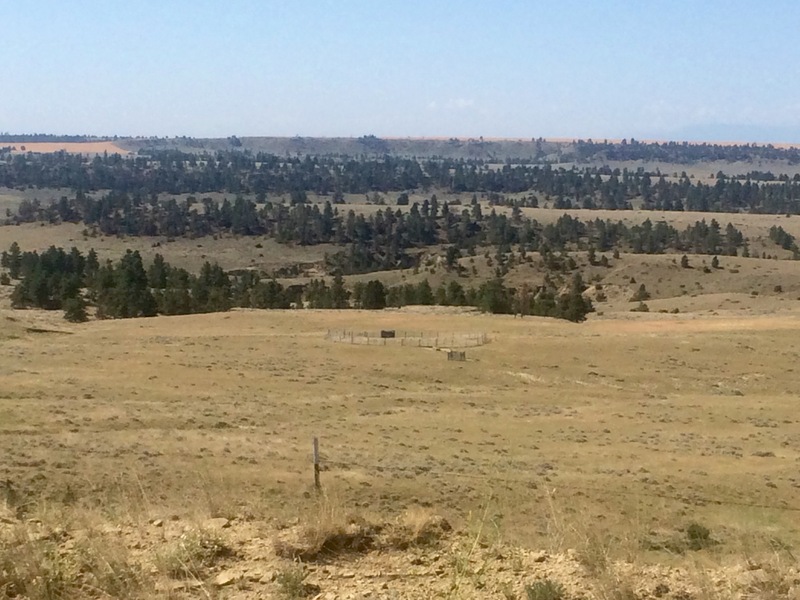 The route for my next ride was inspired as I drove down Highway 3 northwest of Billings. It had been a long day in the car because we had decided to drive from Banff, Canada back to Billings all in one day. 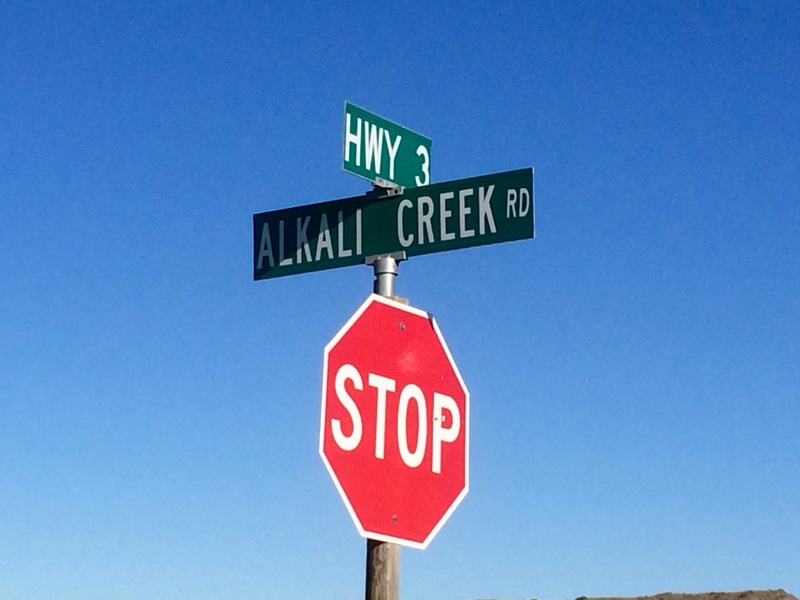 As we neared Billings, we passed a street sign out in the country that read “Alkali Creek Road”. I had just ridden on the bike path along Alkali Creek road the other day when I rode through the Heights. 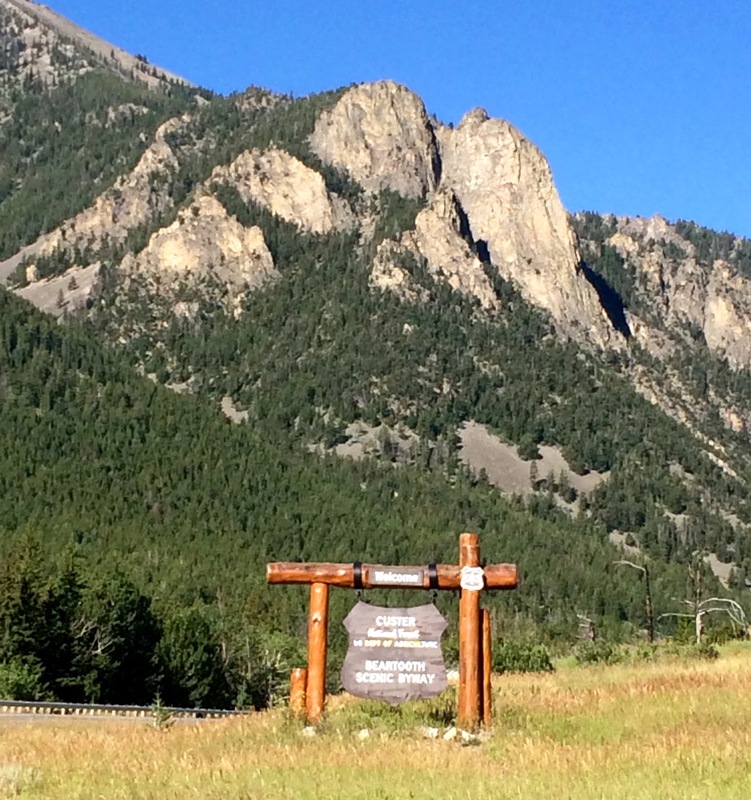 At that time, I had wondered if it connected with another road, and here I had just driven by the intersection of Highway 3 and Alkali Creek Road. My ride route for the next day was planned! “Really.” I replied. He went on to say that the road turned to gravel around the bend. The gravel was so treacherous that he had a difficult time with it on his mountain bike. I told him thank you and said that I would go see this gravel for myself and pedaled away. I was annoyed that I hadn’t done proper research before embarking on this ride and was left to ask a stranger a simple question that he refused to answer. When I saw the gravel, I agreed that it was in fact deep. Deeper than I would have liked to have ridden under normal riding conditions. But I’ve ridden on gravel roads before, and if it was only a short distance, it was certainly doable. But now I wasn’t riding under normal riding conditions; I had been challenged. And nothing makes this girl more determined to do something than a boy telling her what she can’t do. Shortly after embarking on the gravel, I remembered to check the mileage on my Garmin. After about two miles, I bagan to wonder if I might be better off turning back. And then I remembered the challenge. 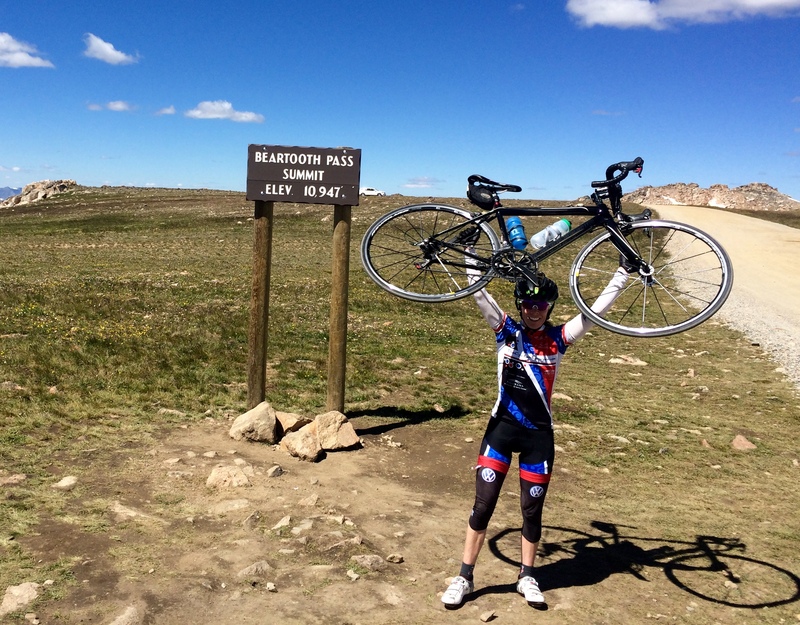 The gravel was unlike any of the gravel roads I had ridden in Colorado. It was more like I was riding through someone’s deep landscaping rock, rather than down a dirt road with the occasional washboard and rocky sections. I kept creeping along the road and thought I may have seen cars moving along Highway 3 in the distance. 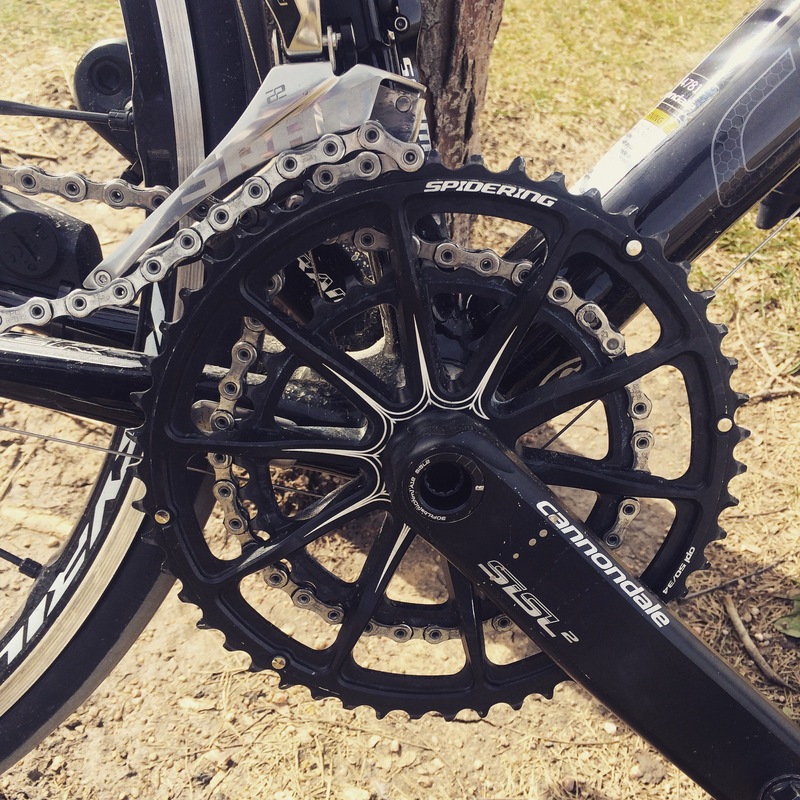 As I pedaled along, I became more and more annoyed with my failure to research the ride more thoroughly; with the fact that I didn’t notice the road being gravel as I sped by the other night; and with my stubbornness that wouldn’t allow me to turn around. I considered letting some air out of my tires so that I might have some traction, but I didn’t want to have low pressure for the remainder of the ride after reaching the highway. Onward I went. After about 4.5 miles had slowly passed, I finally reached Highway 3. There wasn’t anyone around to witness my superior dance, so i kept right on pedaling onto Highway 3 and back to Billings. Will I do better research for my next ride in unfamiliar territory? Maybe. Finding your way is a big part of the adventure. And if it takes a little longer to get there… that’s not necessarily a bad thing when you’re on a bike. 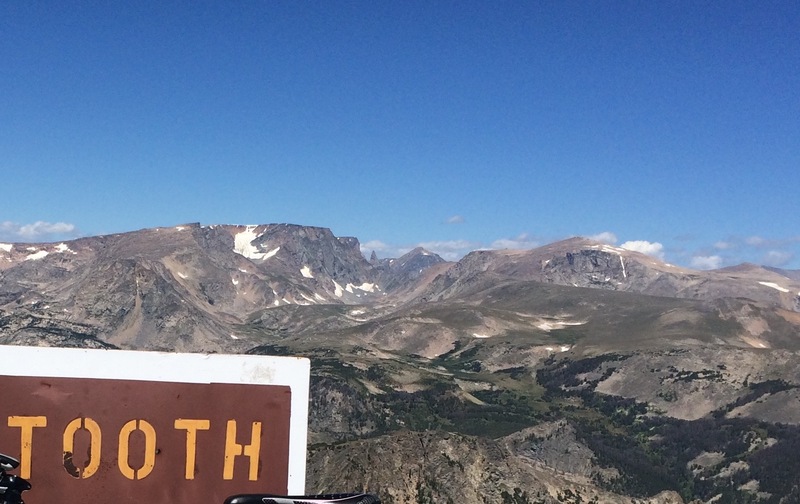 The Beartooth Mountains are just barely visible on the horizon. More on that adventure coming soon! Spring riding can be so elusive with Colorado’s wild spring weather. The last couple of days had been warm enough to melt some of the 18 inches of snow that had fallen nearly two weeks before; during that time, I’d spent more time on the trainer than I like to. I had been out each afternoon this week doing intervals at Lookout Mountain in anticipation of the hill climb coming up Saturday. As I sipped my morning coffee and contemplated riding into work, I heard the birds chirping outside and didn’t see a cloud in the sky once the sun came up. 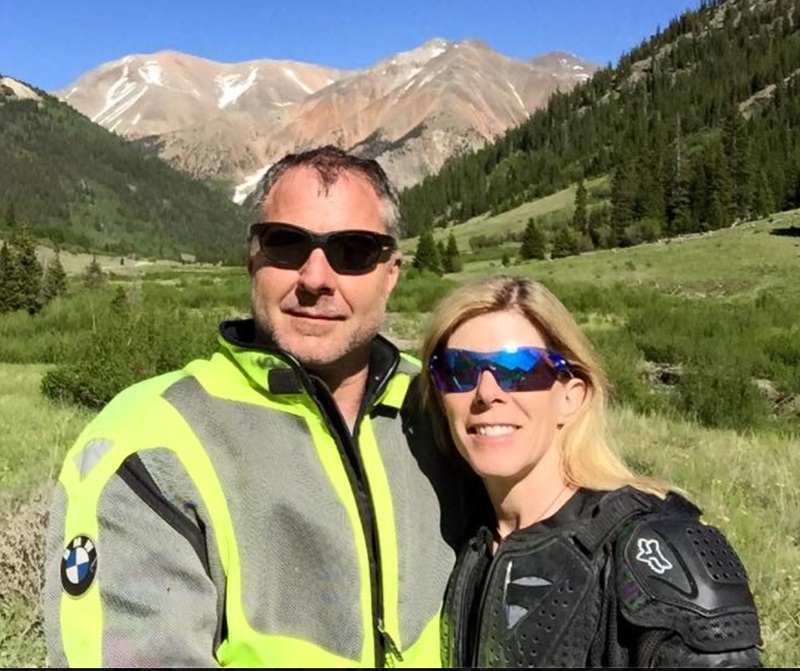 I decided it would be a good day to ride – perhaps a bit chilly on the way in, but the ride would be worth it, especially on the way home when it was warmer. I froze just enough to build a little character on the way into the office. When it came time to ride home, I decided to take a different route just to add on some additional miles and be in the sunshine a little longer. I needed a joy ride! As I pedaled along, I saw lots of other cyclists, dog walkers, and runners out enjoying the sun just like I was. I said hello or waved to everyone I encountered, just like I do on every other ride. Sometimes I get a return wave, but most of the time I don’t get any response. An attempt to downshift resulted in this tangled mess. Fiddle as I might, I could not get the chain unstuck. During the few minutes that I was kneeled in the grass alongside the road with my bike upside down, three cyclists pedaled by ~ 2 men, 1 woman. Not one of them said a single word or paused their pedal stroke as they went by to inquire whether I needed or wanted any assistance. That annoyed me more than the fact that I might be walking home in my Sidi’s. So much for my joyride… and just when I had been contemplating which detour to take next. As I mentioned before, I’m the kind of cyclist who greets and waves to other cyclists that I encounter on my ride. I make a point of slowing and interacting with cyclists that are stopped along the roadside dealing with an obvious problem, especially if it’s a woman. Most of the time I simply confirm that they have the tools they need for the job, but on occasion I’ve provided assistance. At the very least, I can offer moral support or to make a phone call if I’m unable to help. Clearly the standards I hold for myself are not shared by every cyclist. As I started the long walk home, another cyclist pedaled by without a word. Then my phone rang. I got lucky that my husband (AKA Mr. Fixit) was nearby and able to come and pick me up. When he arrived, he was able to untangle the chain so I could resume the joyride home. On my way home, I came upon a little Asian lady who was holding an empty dog leash in the air and looking distraught. I slowed and circled back to her, remembering ALL the people who had ridden by me without a word. Through her broken English, I understood that her little yellow dog had gotten away from her and was now missing. She would sit on the curb and wait while I rode ahead in search of the little guy. Instead of the dog, I came upon my neighbor who was heading in the opposite direction back toward the Asian lady. I asked if he had seen the yellow dog in the direction he had come from. He had not and agreed to tell the Asian woman when he came upon her sitting on the curb. I turned around and continued my joyride home. Whether you decide to help another person clearly in need speaks volumes about the character of your person. More importantly, I’m a firm believer that you get back what you put out there in the universe. So I’ll continue to smile, wave, and offer help to those in need, even those that choose to ignore me. It’s just the way I roll, even on this joyride.